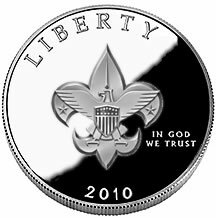 DALLAS, October 16, 2008—President Bush recently signed into law the Boy Scouts of America Centennial Commemorative Coin Act (H.R. 5872) which authorizes the minting of 350,000 silver dollar coins in recognition of BSA’s 100th Anniversary in 2010. Only two commemorative coins are selected for U.S. Mint production each year, and minting of the coins for 2010 will occur between February 8, 2010 and January 1, 2011. For each coin sold, there is a $10 surcharge – representing a $3,500,000 donation – that will be made available to local councils in the form of grants for the extension of Scouting in hard to serve areas.